Its a lovely summer Sunday evening in the US before Asian and European markets open. First we find out that Greek banks will be closed on Monday as millions of Greeks hard fist their ATMs to empty their accounts before the Greek government does prior to leaving the Euro, which seems to be ever more likely by mid-week. And what did the Shanghai Composite Stock Index dropped 6% on Friday June 26, 2015. The A-share ETF for that index (ASHR), representing the highest quality Chinese stocks, dropped 10%. The Euro opened this evening down over 170 pips (about 1.7 cents on the EURUSD pair) from Friday’s close. While you were watching woman’s soccer or reading some hot novel at the pool, I was enjoying myself reading my latest copy of the AAII Journal of the American Association of Individual Investors (once again proving that I have no life at all). What was the lead article this month? You guessed it! It was “Understanding Market Bubbles and How to React to Them”. It is an interview in which Robert Shiller discusses the origins of market bubbles around the world for the last century, and how, despite the expensiveness of current inflation-adjusted valuations, that there is no way to predict interest rate spikes or peaks, or even to really tell when a bubble has begun. What he does mention, which I think makes the article worth reading if you get a copy of it, is that often external forces and world events can change sentiment, regardless of the state of the economy. Those changes can create panics in equity prices that are difficult to predict or even see in chart prices prior to any market price bubble bursting. Take a look at three charts of ASHR that I have set up: 1) the basic candle stick chart 2) The dreaded (though much enjoyed, at least on the radio simulcast I used to do). air traffic control screen for ASHR daily chart, showing the Fibonacci retracement levels and 3) The same daily chart showing the potential AB=CD patterns with targets. Without getting too verbose, ASHR (as did the Shanghai Index on Friday) was rocked by selling, and the gap represented by the drop was wide. You can see that in chart 1. In chart 2, the air traffic control screen caught the momentum low on February 8, 2015. Because you would have gone blind looking at fan lines, I did not increase the sensitivity of that screen for momentum lows, but another one hit on March 8, 2015, and that became the X point of reference. It showed that the low we hit on Friday June 26 produced a B point that aligned with Friday’s momentum low and the 61.8% (o.618) retracement of the distance from the June 14, 2015 high (the highest high in that swing) from that March 8, 2015 low. As ASHR did NOT close on its low and that you did see a 127.2 extension of a previous swing low that lined up with it, odds are now greater than 50% that the low is a solid near-term low and that a rally will occur to protect that low for awhile. On chart 3, I looked at the two major price resistance areas, one at a 38.2% retracement and one near the 50% retracement (the 0.50 line is obscured a bit). It is possible that it could rally all the way back to a 61.8% retracement, but since there is considerable price resistance at those two levels, I decided to work on what would be the two worse case scenario of a stalled out rally, which typically happens with these kinds of patterns. They are NOT perfect Gartley patterns, but they still show up a lot. If there is price symmetry (A to B equaling C to D) in the decline after the stall out, the 0.382 retrace would lead to a target low (D1) of roughly 35.40 and the 0.50 retracement would produce a target low (D2) of roughly 38.25. Those would be drops from the momentum high of 55.19 of 35.9%(D1) and 30.7% (D2) respectively. That is not nearly as extreme as some of the Hang Seng Index drops of the mid-1990s (which I shorted via put warrants), but it would be severe if it happened. Is it going to happen? Who knows, but if that scenario of resistance followed by correction is symmetrical, then it is decently likely at this point. In China and in the US, margin debt in equities is at extreme levels, as shown in this chart I received from Larry Pesavento while writing this post. There are other antecedent conditions that could lead to sell offs brewing, but, as Mr. Shiller stated, until something substantially moves the risk free rate of money above zero basically, the asset value of equities can and will increase. At any rate, we need to be clear about what we are holding long and why, and not just holding on for the sheer fun of it. Fun can turn nasty pretty quickly when the combination of margin and fear mix. More is coming! Thank you once again for supporting this blog! 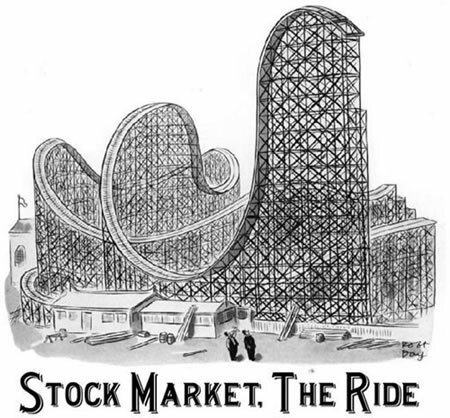 Next post: Weekly Reversal Report for 7/6/2015 – ASHR Redux – We Got Part of That Countertrend Rally, And Then…. Previous post: Weekly Reversal Report For 6/22/2015: Humana Imperfect For Swing Trading; $SPX May Be Near An Inflection Point. Is It Time To Worry About The Robot Apocalypse?